Supermarkets have been urged to keep daffodils away from fruit and vegetable aisles this spring - in case they are mistaken for food. In a letter to major stores, Public Health England warned the flowers could be confused with onions or Chinese vegetables, and consumption of them was an "emerging risk". Daffodils contain toxic alkaloids that can cause severe vomiting, it said. 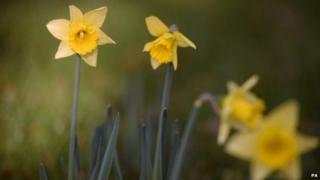 It noted 27 cases of poisoning linked to daffodils and narcissi last year. Prof Paul Cosford, director for health protection at Public Health England, wrote a letter to the stores headed "steps to avoid daffodil poisonings this spring". He said: "Each spring stores such as yours provide a wide selection of flowers, particularly cut daffodils and daffodil bulbs. "Unfortunately there are rare occasions when the bulbs are mistaken for onions, and the stems or leaves are mistaken for a type of vegetable popular in China. "As I'm sure you are aware, daffodils are dangerous if eaten and poisoning can occur as a result." He continued: "We are asking you, along with all other major supermarkets, to ensure that daffodils, both the bulbs from which they sprout and the cut variety too, are displayed well away from the produce or fruit and vegetable area." Daffodil poisonings in Britain are not unheard of. In 2012, Bristol's Chinese community was urged not to eat daffodils after 10 people had to be treated in hospital. It was thought they may have mistaken the green parts of the flower for a chive used in Chinese cooking. A spokesperson for Public Health Wales said they supported the guidance.